I was rather ambivalent about the opening ceremony of the 2012 Olympics. HM Elizabeth II actually received her spy in person, and that’s not the half of it. She’s the Head of Government, the Queen. He’s supposed to be a secret agent known only by a number. Should they need to communicate, that’s what M is for. James Bond and the Regency townhouse have something in common, it seems. Neither are immune to changing tastes. The club is housed in the famous casino known as Les Ambassadeurs–or, “Les-A.” It occupies No. 5 Hamilton Place, an area of Mayfair developed for the Regent in 1806 by the architect Thomas Leverton. He died at No. 5. The earl met an early end at the age of 56, the consequence of being thrown from a horse. He suffered a “tedious” three months after the accident, going to Bath upon the advice of his doctors. He did not improve and demanded to be taken back to No. 5 Hamilton Place where he died. No. 5 then became the home of the 1st Marquess of Conyngham. 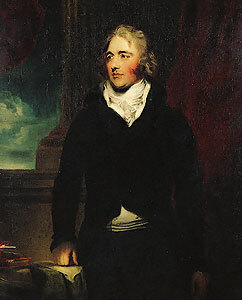 Henry Conyngham (1766 – 1832) was an Irish peer and a “familiar” friend of the Regent, serving as lord steward when the Prince became George IV. Upon his king’s death, he broke his staff of office upon the coffin of the monarch, as was the custom. Lord Conyngham had an interesting lineage. A considerable part of his fortune came to him by way of his grandmother, who retained full control of her estate through two marriages. Another ancestor, one Edward Burton, narrowly escaped imprisonment and execution during the persecution of the Protestants. His death was apparently the result of “excessive joy” at the death of Bloody Queen Mary in 1550. Years later, the house passed from the Conyngham family to the Rothschilds, who made it over in the fin de siecle Louis XV style. This heavily ornamented renovation covered over the elegant Regency decoration both inside and out. Like 007, No. 5 is something to be made over to suit modern taste, until it is scarcely recognizable.